It won’t be long before the green flag flies to kick-off the 2018 race season and the Graham Racing of Craig and Brandt Graham will be front row centre when the action starts. The father and son operation – based in Orono, Ontario – has earned a reputation for bringing top-shelf equipment to the table at every event and this year’s schedule will be no exception. After following different directions a year ago, the pair will open the new season sharing the weekly stage at Brighton Speedway. 45-year-old Craig Graham will compete in his second year with the track’s Pro Late Model division, looking to improve on last season’s top 15-point finish. 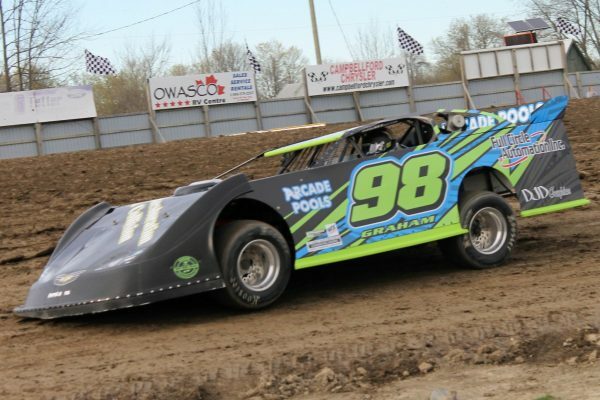 19-year-old Brandt Graham – fresh from the second of his back-to-back championships on the Lucas Oil Sportsman Cup Series tour – has his sights set on the rookie of the year honours in the 3rd of a mile clay oval’s Canadian Modified class. Craig Graham says it will be good to have both cars at the same track once again. Graham Racing has become the benchmark that other teams can shoot for when it comes to making sure their cars are equipped for battle. At the shop, behind the scenes and at the race track, the effort never stops as changes are made and adjustments performed to keep up with varying track conditions. Family, fans and friends can follow the team throughout the season by visiting www.graham98racing.com. The team is also very active on social media, with updates available by liking the Graham Racing page on www.facebook.com or following @Graham_Racing on Twitter. Craig Graham puts his Pro Late Model through its paces during the 2017 season opener at Brighton Speedway. The father and son duo from Orono, Ontario will spend the 2018 schedule at the local 3rd of a mile raceway.